At this point, the singer only has two dates in Portsmouth, NH and Northampton, MA, but there is talk of a long tour coming in the summer. O'Connor has had a series of mental health and depression problems over the last several years and has made a mention on the Dr. Phil show that she was changing her name from Sinead O'Connor to Magda Davitt to be "free of parental curses". So far, her site still goes by its old name although visitors will be greeted by a simple white page that says it is under maintenance. The two dates are billed as "Sinead O'Connor aka Magda Davitt". 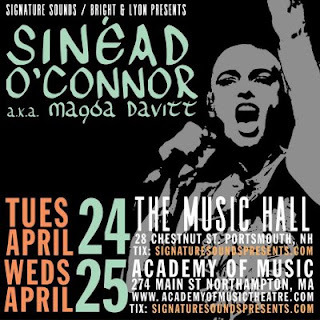 Sinead has not performed live on a regular basis since mid-2015 although she sang a song at Shane MacGowan's 60th birthday party in January.